Years back when we used to watch a good advert in Indian television channels, some weeks later the same advertisement would appear on a Nepali channel only change it would be voiced over in Nepal. And now after so many years the trend is there and why is it still there. We are killing our own advertisement industry. There are some good adverts like the Jagadamaba Cement Advert (below) and Nepal Samachar Patra (below) but the voice over ads of Fanta, Fair and Handsome and a lot others makes me feel what do the Advertisement and media companies do here?? Translate the jingle and use some words you are done, no copy writing, no copy editing, no jingle composition, no model selection, no shooting. Just some video editing with voice over and the deal is sealed. I really hope this scenario changes and it changes soon. 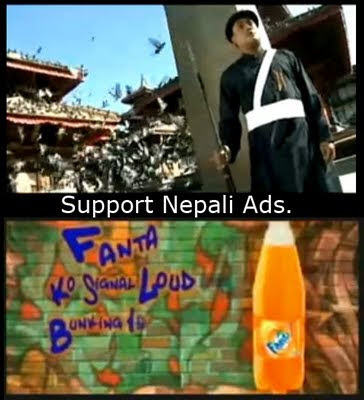 Let’s vote for Nepali adverts by and for the Nepali people.